Visual Studio Code>Programming Languages>NG PlantUMLNew to Visual Studio Code? Get it now. Preview & generate PlantUML diagrams in VSCode. This fork provides much faster preview and exports via the use of nailgun. The increased speed does, however, come at the cost of some configurability (missing configuration options are higlighted below). This plugin provides rich support for PlantUML in VSCode, covers edit, preview, export and other aspects. Preview Diagram, Press Alt-D to start PlantUML preview. Instant preview, if diagram's been exported. At cursor, in current file, in whole workspace, in workspace selected. By default, format only indent code blocks and not change your line text. It's safe. You can enable inline format with setting plantuml.experimental.formatInLine. Be careful, inline format is a very early experimental function, it may broke your code! Use it at your own risk! diagram: snippets for general diagrams elements. activity: snippets for activity diagrams. class: snippets for class diagrams. component: snippets for component diagrams. state: snippets for state diagrams. usecase: snippets for usecase diagrams. sequence: snippets for sequence diagrams. ui: snippets for salt diagrams. egg: snippets for some funny diagrams, like sudoku, earth. Press Ctrl+Shift+O to list all diagrams in the file. You can name the diagram when diagram starts. Notice: People who don't use !include could ignore this chapter. 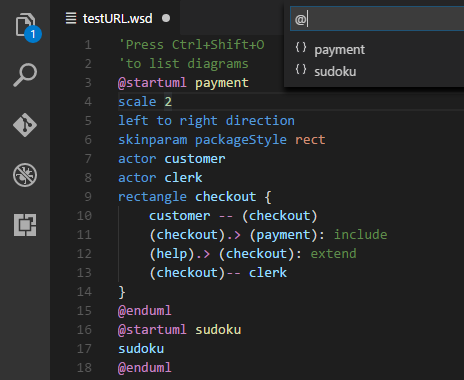 Auto Include liberates you from writing "!include path/to/include.wsd" everywhere. which is bother & hard to manage. Java : Platform for PlantUML running. plantuml.fileExtensions: File extensions that find to export. Especially in workspace settings, you may add your own extensions so as to export diagrams in source code files, like ".java". plantuml.exportFormat: format to export. default is not set, user may pick one format everytime exports. You can still set a format for it if you don't want to pick. plantuml.exportInPlace: export diagrams in the same folder as the host file with the same name as the host file. plantuml.exportSubFolder: export diagrams to a folder which has same name with host file (ignored if plantuml.exportInPlace is true). 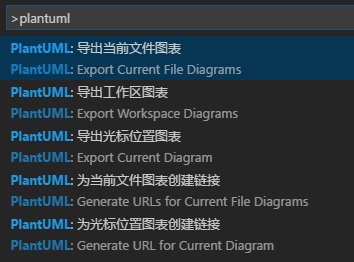 plantuml.exportOutDirName: export workspace diagrams will be organized in a directory named with value specified here (ignored if plantuml.exportInPlace is true). plantuml.previewAutoUpdate: Dedecides if automatically update the preview window. plantuml.previewFileType: Preview file type, png or svg support. But svg preview cannot support sudoku, earth diagrams etc. plantuml.previewFromUrlServer: Use plantuml.urlServer to generate preview images. plantuml.urlServer: plantuml server to generate UML diagrams on-the-fly. plantuml.urlFormat: URL format. Leave it blank to pick format everytime you generate a URL. plantuml.urlResult: URL result type. Simple URL or ready for MarkDown use. plantuml.includes: Files or folders to include before preview/export diagrams. You don't have to write "!include path/to/include.wsd" for every single diagram any more.